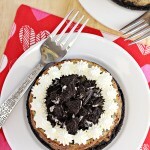 This Mini Oreo Cheesecakes for Two recipes will be the perfect answer when a large cheesecake is too much. Made in two 4″ diameter springform pans. Preheat oven to 300 degrees F. Grease inside bottom and sides of two mini 4″ springform pans with cooking spray or butter. In a small bowl, combine crushed Oreos with melted butter. Divide crumbs between the two prepared springform pans. Press crumbs evenly into the bottom of the pans. In a large bowl, beat cream cheese and sugar until well combined. Add the vanilla and sour cream and beat until well blended. Add the egg last, beating just until it is combined with the other ingredients. Stir the 4 chopped Oreos into the batter by hand. Don’t overmix. Divide batter between the two prepared springform pans. Place the filled pans on a baking sheet. Bake for 20-25 minutes, or until cheesecake is filling is set. You will want it to be slightly jiggly in the middle – about a 1″ spot or so and it will appear moist, when compared to the edges. When done, turn off the oven heat, leave the cheesecakes in the oven and leave the oven door open slightly. Leave the cheesecakes in the for about 30 minutes. Then, remove from oven and allow to cool to room temperature. If desired, decorate with whipped cream and chopped Oreos.